Nest won the wall wart popularity contest, but can it keep its crown? New: Works with Amazon’s Alexa! New: Status display in 4.3 update! Nest Learning Thermostat first hit the US market in 2011 and – almost overnight – turned what used to be a boring household appliance into a little taste of the future. Gone were the days of tediously programming a thermostat (it learns! ), worrying about whether you left the AC on (tweak its settings from anywhere! ), or puzzling over how to change your thermostat’s existing programming (intuitive design!). Even better, the Nest does actually deliver on its primary promise to lower household energy bills. The Nest family grew to include the Nest Protect – a sophisticated smoke/CO detector that can tell the difference between burnt toast and a burning home and can alert you via your smartphone if something’s up at home. As we update this review in February 2015, however, the smart thermostat arena has some exciting new contenders! Ecobee’s ecobee3 thermostat is nothing short of a smash hit with consumers (read our ecobee3 review), and a dozen or so other companies are jumping in with everything from thermostats to full-fledged home automation suites. 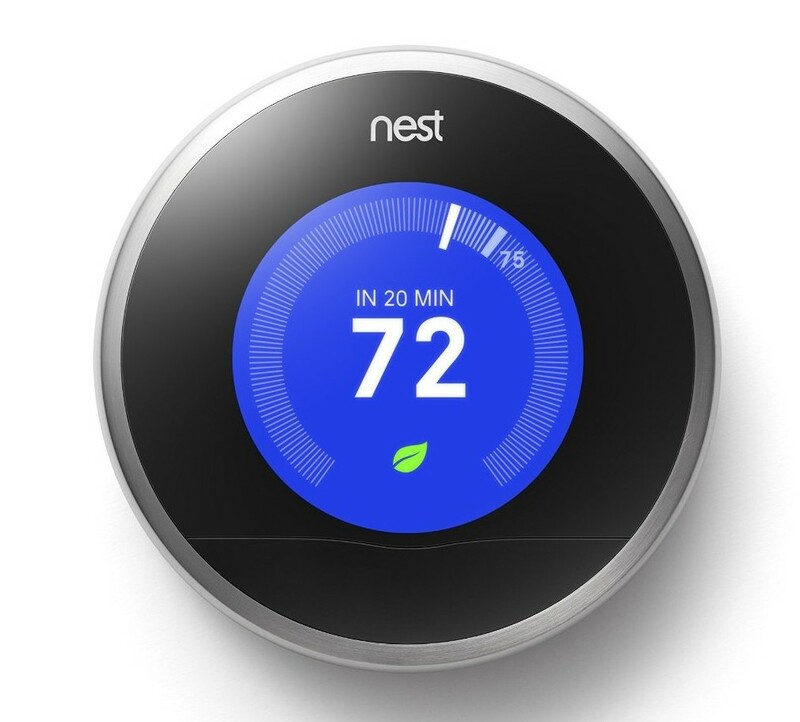 Nest needs to keep innovating to stay ahead of the hungry pack, and fortunately, it has: Nest rolled out a major software update (4.3) on November 4th, 2014 that adds useful system and temp information to the unit’s display, a system test feature, and improvements to auto-schedule. 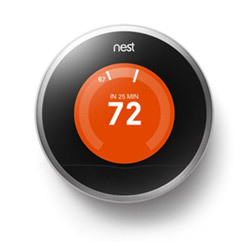 Let’s take a closer look at the Nest Learning Thermostat. The Nest’s companion app gets high reviews and includes support for multiple temperature zones. Minimalist, intuitive user interface design is friendly to geeks and non-techies alike. No tricky programming, just carry about your routine for a week and Nest learns it. Access thermostat settings remotely with companion app and/or Nest website. Change the temperature without leaving the couch! Adjust the daily program the Nest develops for you. The Nest makes its best guess, but you can always tweak the program. Time estimates. How long until your home reaches the desired temperature? Nest can tell you. Energy usage reports let youexplore your energy usage history for ways to improve. Nest is easy to plug in and hook up. Nest’s manufacturers claim compatibility with 95% of HVAC systems, but many users report that Nest thermostats lose their charge when installed on systems lacking a C-wire. The problem seems to be related to how often the HVAC system is run – if you simply don’t run your heat that often, your Nest may not be able to draw enough power to charge itself on a regular basis. A new C-wire can be added to an existing HVAC system by a professional, however, installation costs are typically $100-150. Choose an energy-efficient temperature and the Nest rewards you with a little green leaf icon. Watching your collection of Leafs grow in the energy reports is a satisfying and fun way to save energy. The user interface on the Nest is polished to a shine. Everything is intuitive, especially if you’re a fan of Apple’s products and modern design conventions. The iOS/Android companion app is also highly rated. Many users, especially those who were frustrated by the programmable thermostats of a few years ago, rave about the user interface’s simplicity. 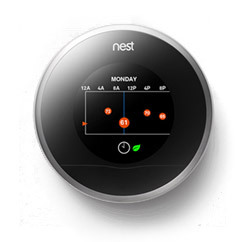 Adjusting the Nest’s temperature schedule can be done on the unit’s screen. The screen is kept powered off until the motion sensor at the bottom of the Nest’s front panel detects a user standing nearby. 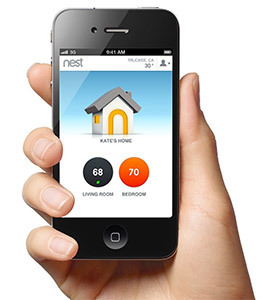 Since its introduction in October 2011, Nests have silently received over a dozen automatic software updates. The updates keep coming, too – a major release came out in November 2014 adding the much-requested on-unit status displays. Now you can tell at a glance and a turn of the ring what mode your system is running in, what your energy usage is like, the outside temp, humidity, indoor temp, and more. It’s futuristic! Plus, you can’t beat the brand-name recognition. 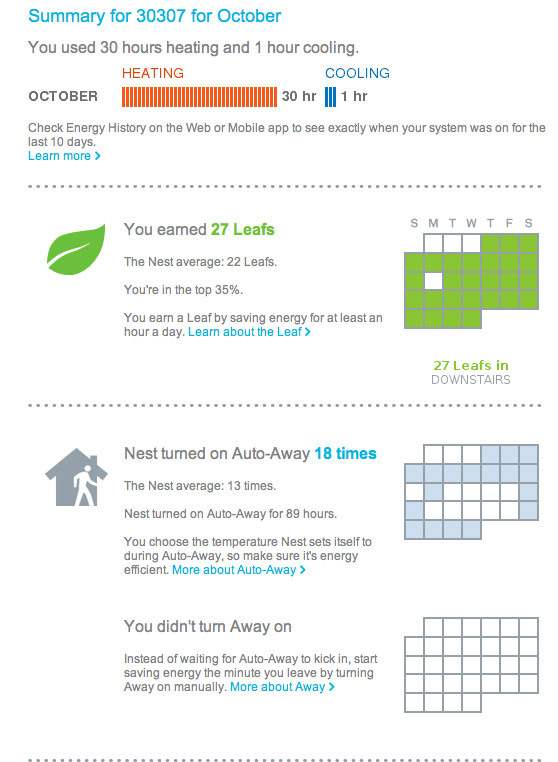 The monthly reports encourage energy-saving choices by rewarding Leafs and comparing your stats to those of other users. In general, though, the reports are somewhat of a disappointment. They tell you how you did in only the vaguest of terms and don’t give you much in the way of precise data. Grow your Leaf collection with smart energy decisions. Between the ease of use and encouraging energy reports, it’s no wonder the Nest made such a splash when it debuted. Nest owners cycle through menu options by twisting the silver ring that surrounds the device and push towards the wall to confirm choices. In this regard, it mimics the old fashioned thermostats that many people are familiar with. Users with limited wrist/hand mobility may find it challenging to twist the ring. The 2nd Gen Nest protrudes 1.26″ from the wall, which is slimmer than the 1st Gen Nest’s 1.60″ profile. Nearly all wireless routers meet these standards. 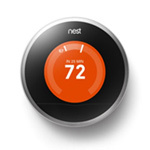 Nest’s manufacturers state that the Nest thermostat is compatible with 95% of low voltage heating & cooling systems. This includes electric, gas, oil, forced air, heat pump, and radiant. The Nest is also compatible with dual fuel systems (heat pump and furnace), but professional installation is recommended. While most users are able to install their Nest in under 30 minutes (it’s about as challenging as changing a light switch), the problem is with systems that lack a “C” wire. The “C” wire provides 24V power to the Nest, and in its absence, the Nest draws power from the existing wires. That usually works fine, until you experience moderate temperatures that require neither heating nor air conditioning. During these times, the Nest draws power by “pulsing” the R-W heat circuit. Nest claims to be compatible with single-stage systems with two (heat only) or four (heat and air conditioning) wires. Nest offers a compatibility guide to help consumers determine if the Nest is right for their system. Maybe it’s a weird thing to complain about, but the Nest looks like a futuristic piece of space technology and some homes and walls just… don’t. Will the Nest look odd in your country-cottage themed entry hall? That’s for you to decide. The Nest basically defined the smart thermostat category, but some issues with installation and reliability have dinged its reputation. Automatic updates to the Nest’s firmware may resolve these problems in the near future. Consumers craving a sleek-looking and user-friendly thermostat will enjoy the Nest, and so will data-crunchers looking for monthly readouts. Installed Nest thermostate was working fine. Turned heat and a/c off but the fan will not turn off. Where are your “troubleshooting tips? Thanks. I have exactly the same problem when I installed in this afternoon, then I Nest Tech told me the W1 was shorted inside the base unit. I went to exchange a brand new one from Lowes, but now the heat cannot be turned off. I’m a huge fan of Nest, as it integrates with virtually all of my home automation products. If you’re on the fence, I highly suggest taking the plunge! While imperfect, Nest has a few big pros over its competitors. I particularly like that it works with Time of Use energy plans to make sure you aren’t using too much energy when your rate is higher. It’s also a highly recognized brand, so you’re more likely to get a rebate compared to other brands.